HRD Coffee Shop is no ordinary hash house. It is a small, crowded diner that was featured on ‘Diners Drive-Ins and Dives”. HRD is located in the edge of downtown San Francisco. Parking in the City can be a challenge and a spot right in front must have been a sign of good food to come. There was also a line out the door at the 12:30 noon hour. I put several dollars of change in the meter and took my spot in line. 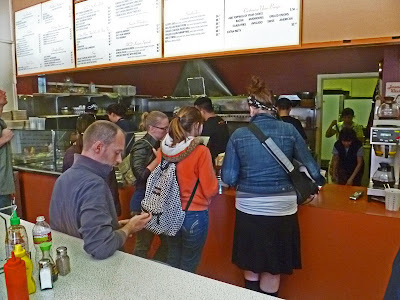 The line moved pretty quickly because of the large assembly of workers behind the counter. It was amazing how they all worked together in such cramped quarters. My original plan was to try the marinated pork chop that was featured on the show. It sounded delicious. There was just no room at the inn. 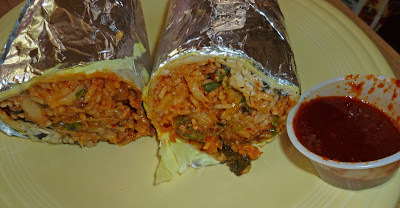 The kimchi burrito to go was my backup plan. In no time flat I was heading back across the bridge to Mad Meat Genius headquarters. You be driving the bus to flavor town again. I have never tried kimchi. The burrito looks like da bomb. Greg, Kimchi is one of those food items where you love or dislike. It has an interesting and dynamic flavor. Guy has some of the best lines. I want to go there - several of the dishes sounded really interesting and tasty. Even if Guy Fieri approves. Zoomie, I smell sarcasm. Guy Fieri is one of the most popular food celebrities today.